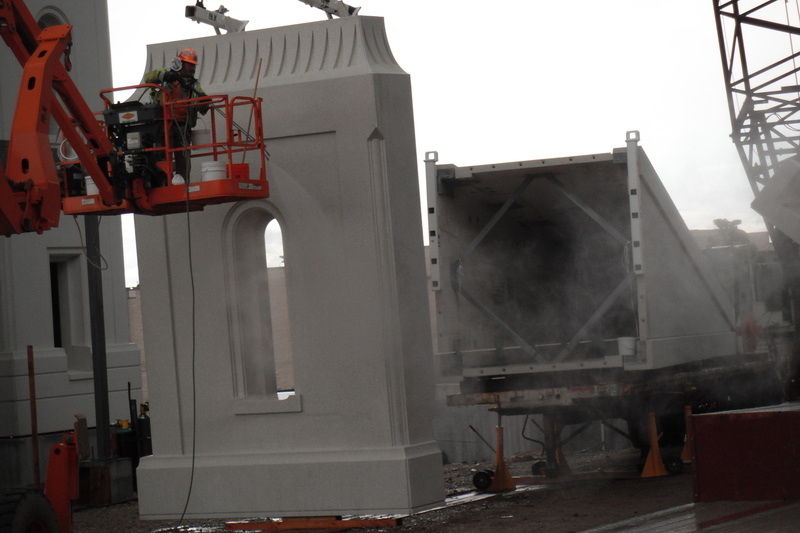 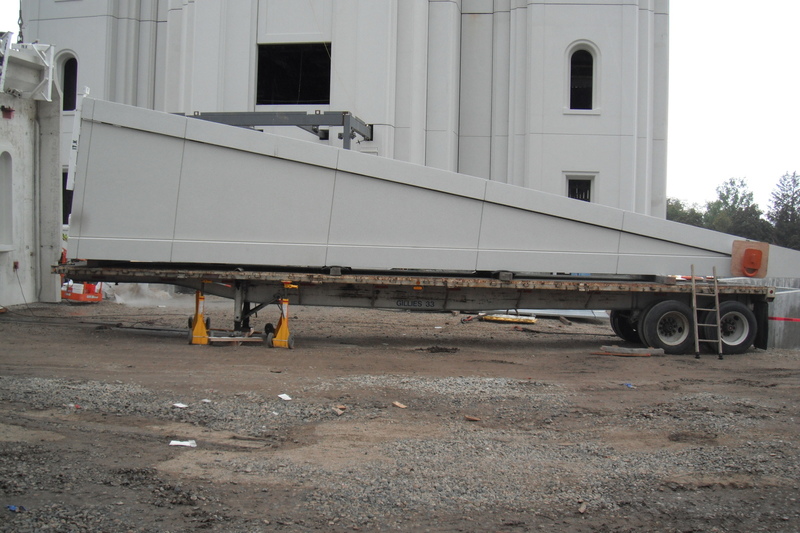 On Wednesday we saw a continuation from a week ago of the installation of the exterior panels of the temple. 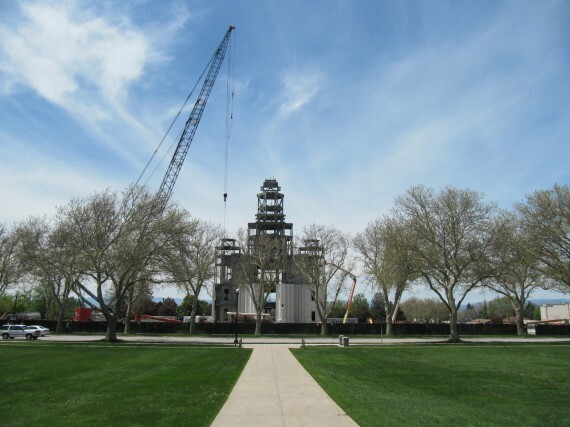 As a tribute to Brigham City and the pioneers, living peach trees will be planted in the grounds. 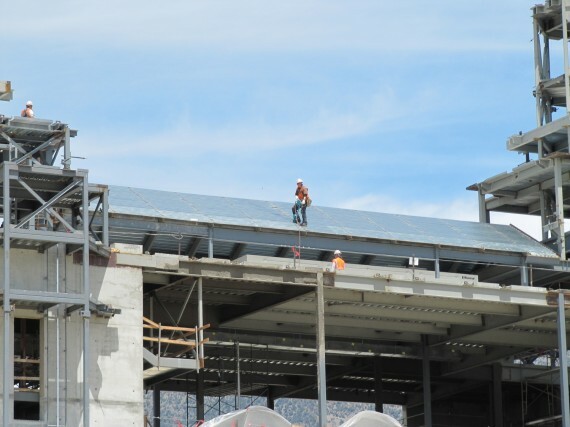 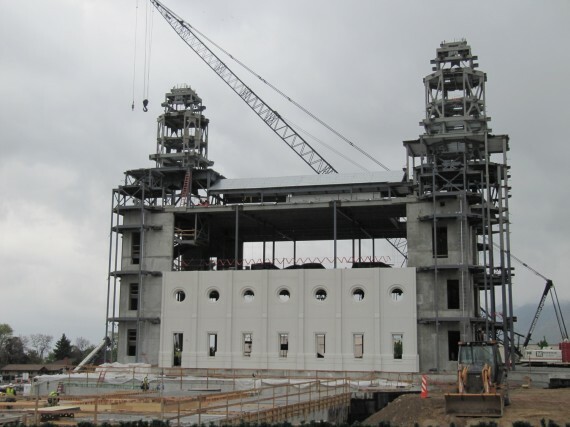 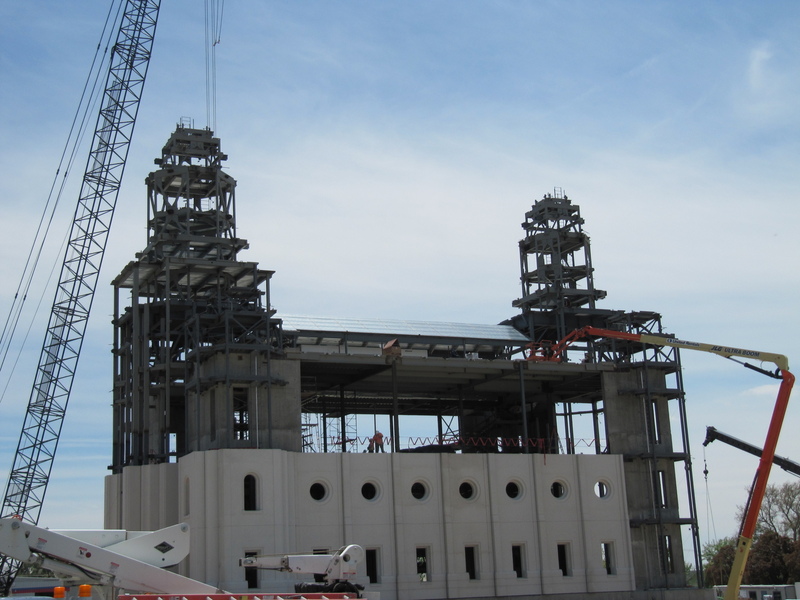 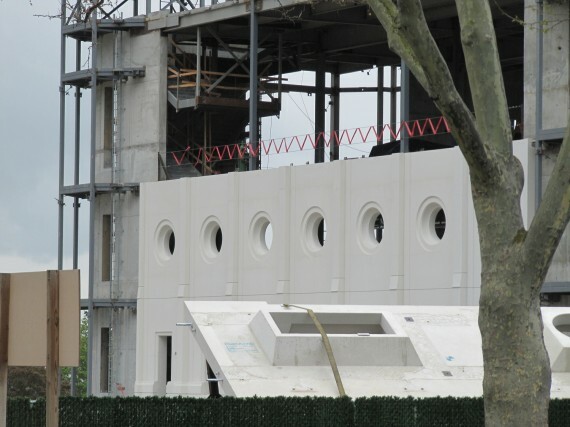 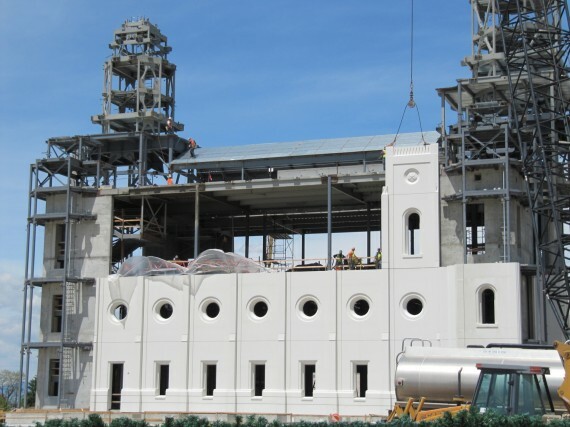 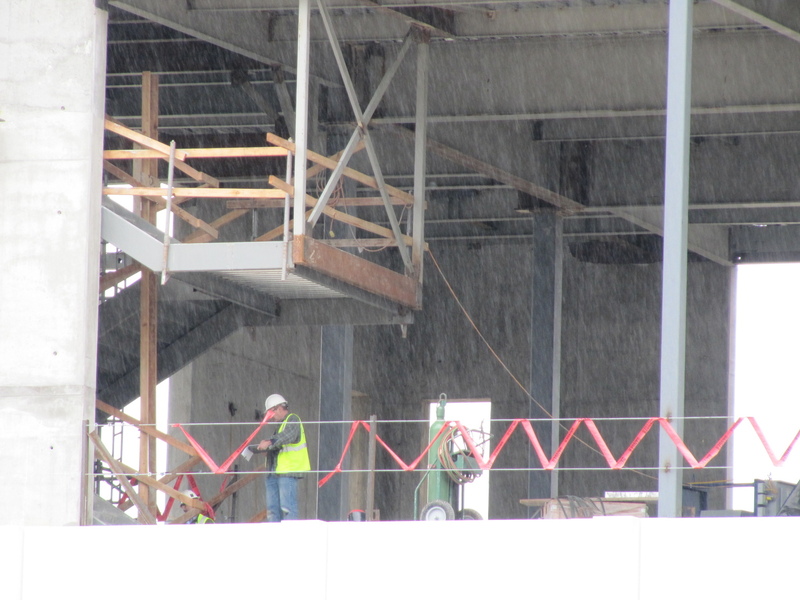 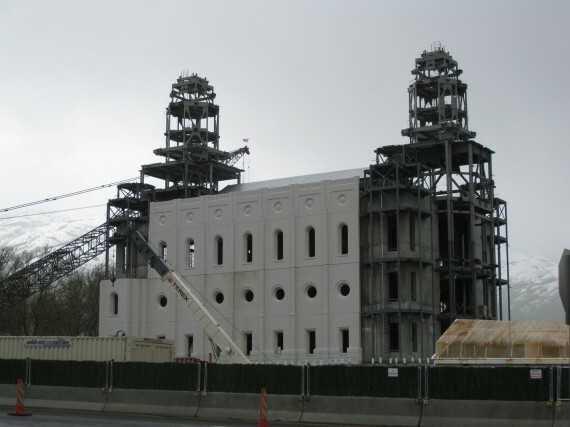 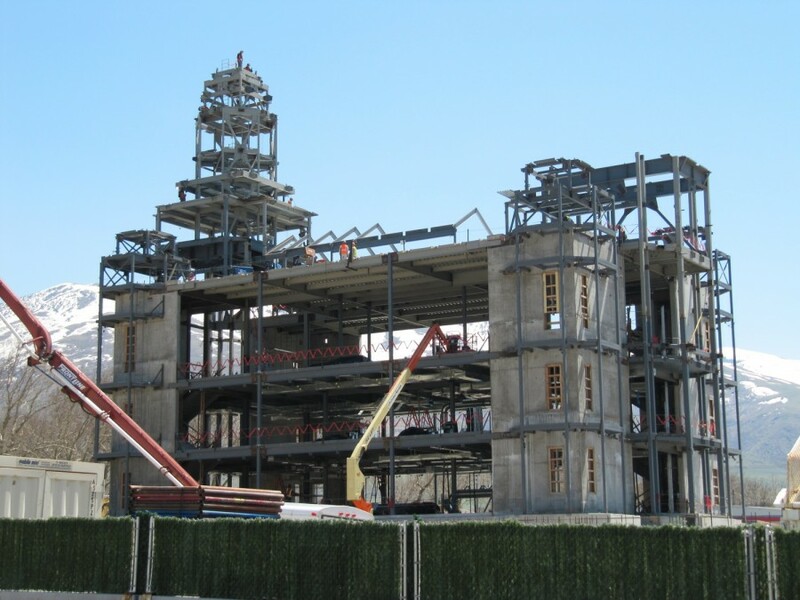 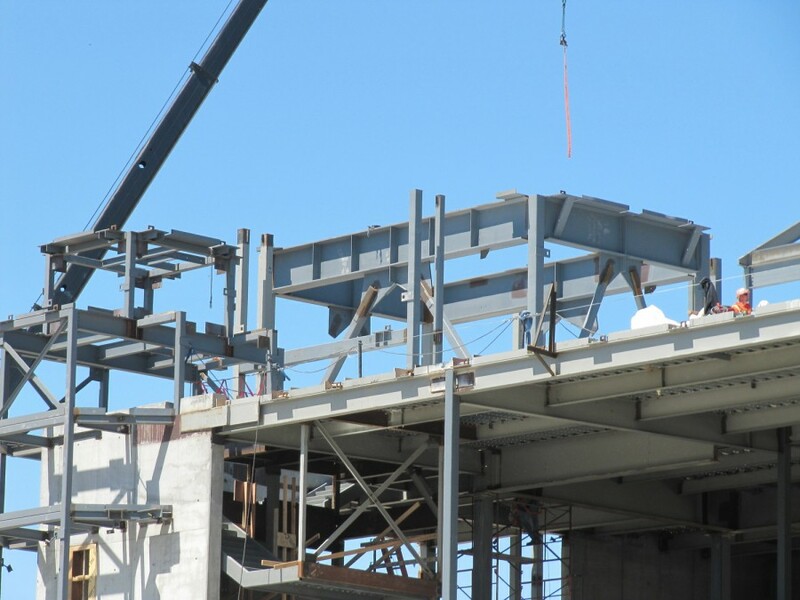 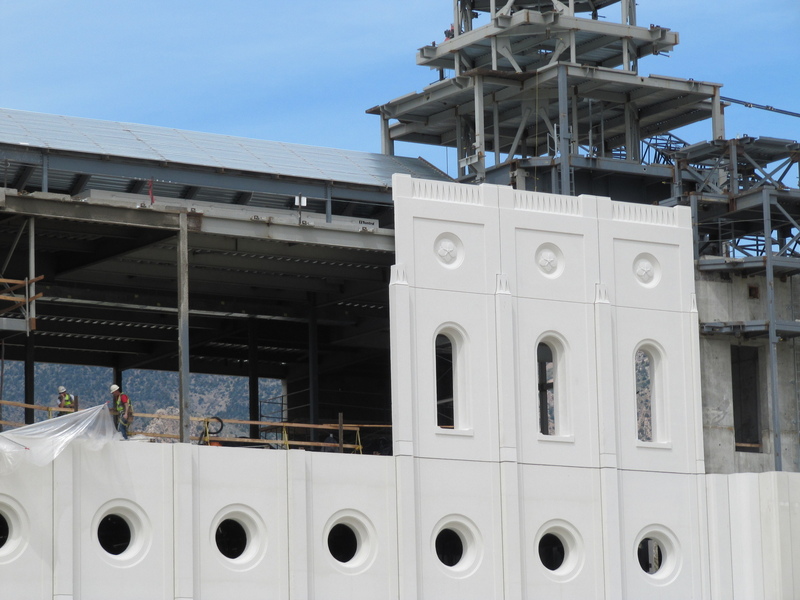 The precast concrete panels have a peach blossom motif that will also be continued for the interior design, etched into the windows, stained glass, and other artwork. You can see the peach blossom motif on the walls in the photographs (click to enlarge). Not all Co-op enterprises were in Brigham City. 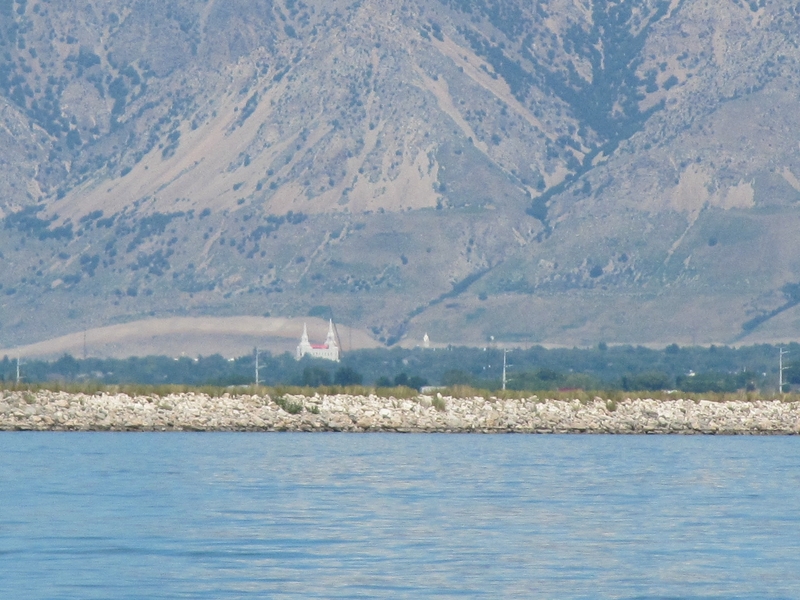 For example, the dairy was established in Collinston, about 20 miles north of Brigham City. 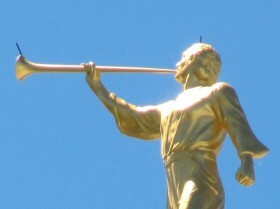 Christian Hansen managed the dairy. His wife Elizabeth, who had made cheese in her native Denmark, supervised the dairy’s cheese production. 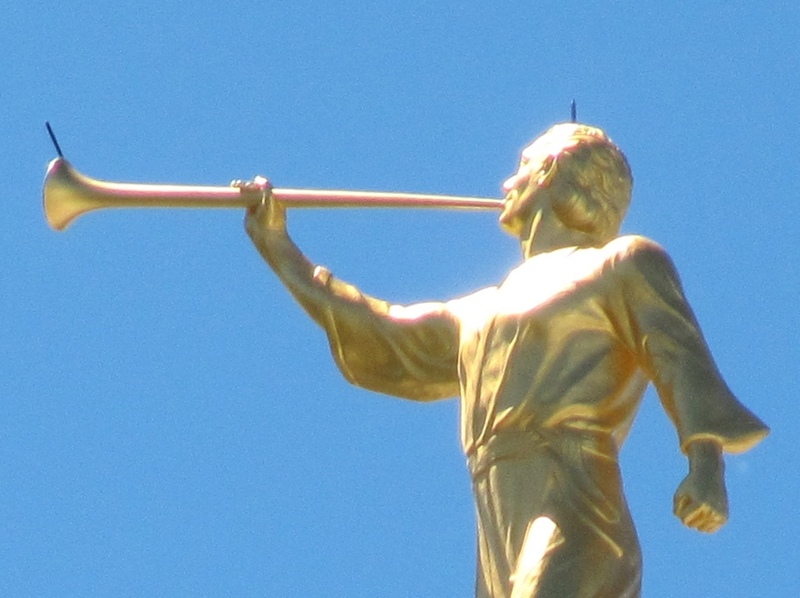 They asked farmers to give the dairy use of their cows in the summertime in return for cheese and butter. Between 300 and 700 cows were left there each summer. 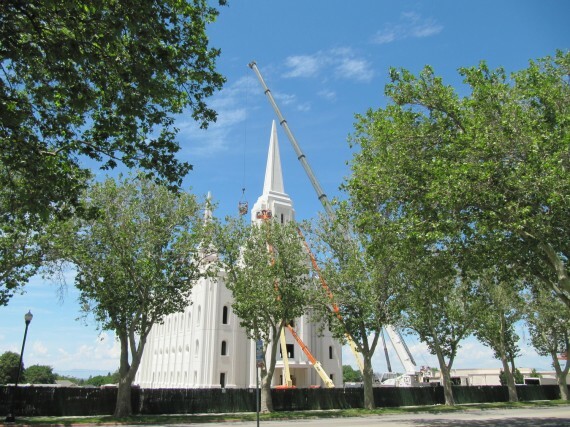 Brigham City’s Pioneer Days celebration in 1875 featured displays from 29 cooperative departments. 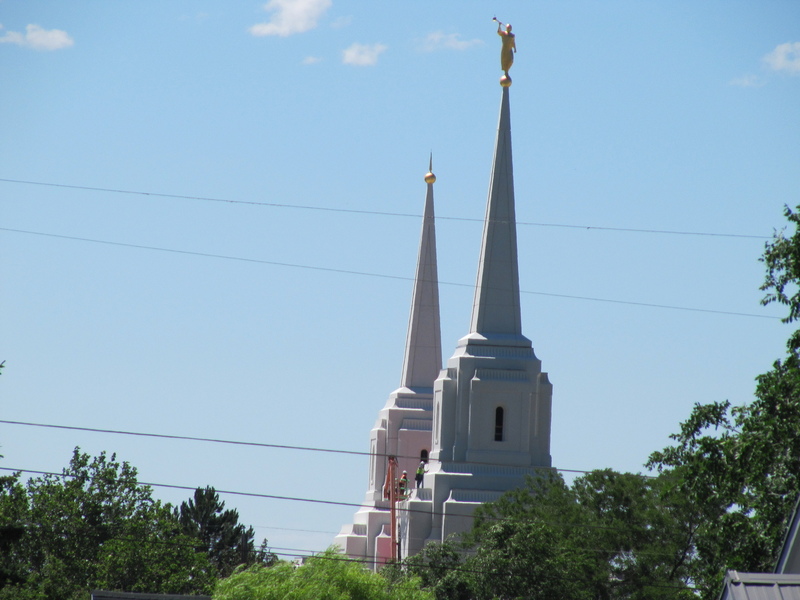 The Brigham City Co-op became a model for other Mormon settlements to follow. 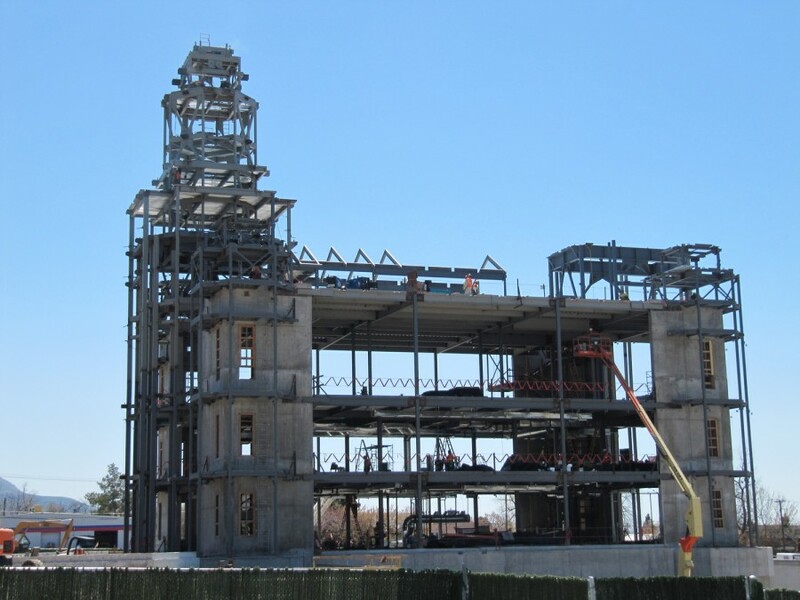 The Co-op maintained a high level of success until the late 1870s when a series of disasters occurred. 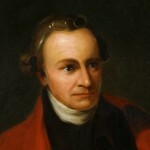 Some of the problems were crop failures due to drought and grasshoppers, destruction of the woolen mill by fire and loss of the saw mill to the federal government. 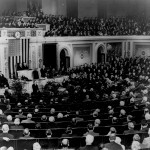 In 1878 a federal tax was levied on local currency used for trade, and $10,200 had to be borrowed to pay the assessment. 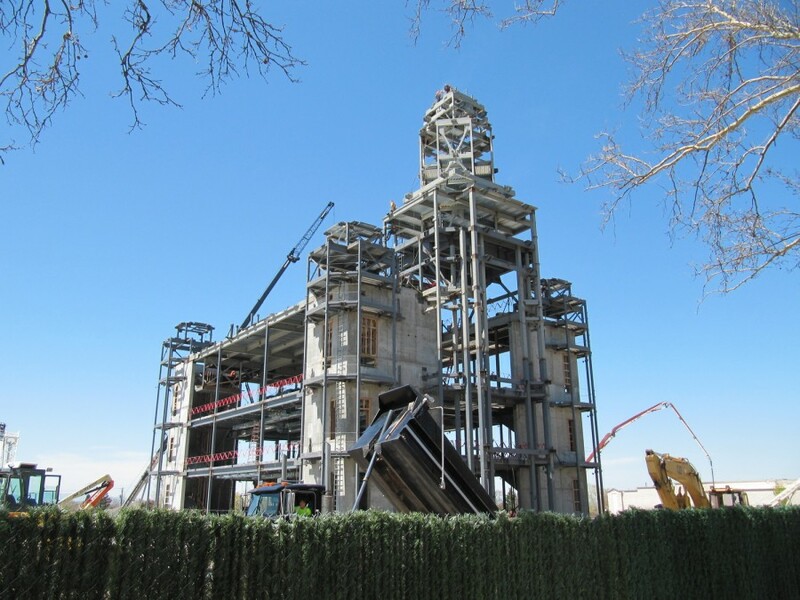 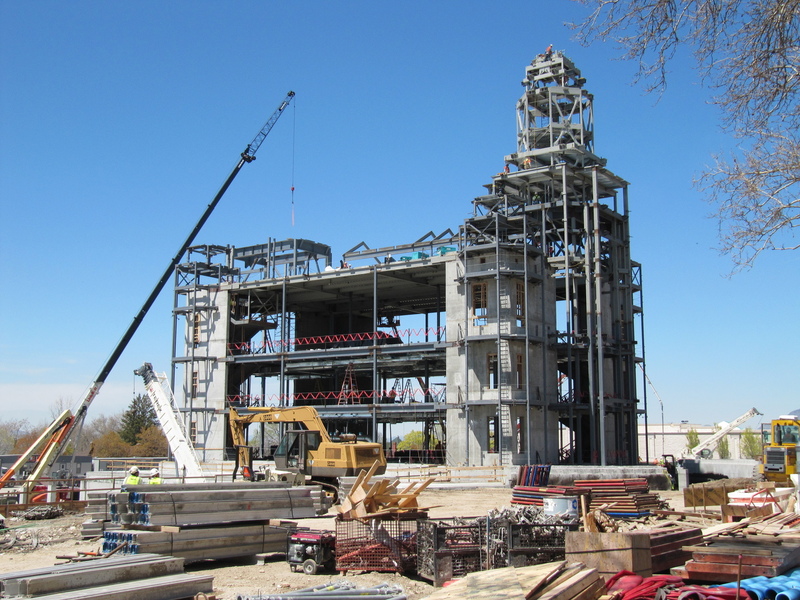 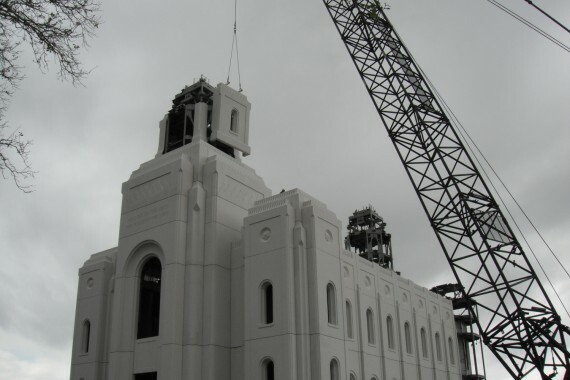 It has been almost two weeks since we last had photographs of the Brigham City Temple. 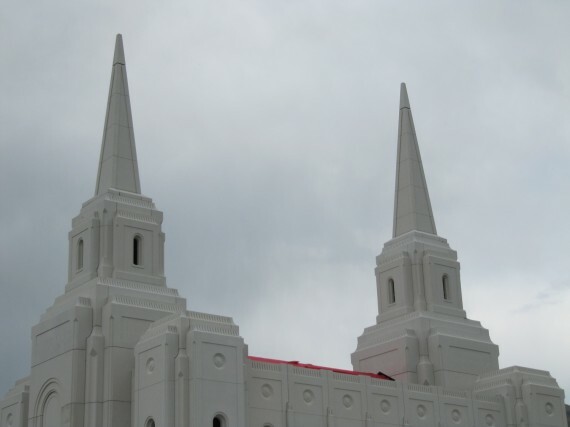 The news last time was the beginnings of the west spire. But just today the walls of the temple were being attached to the frame. 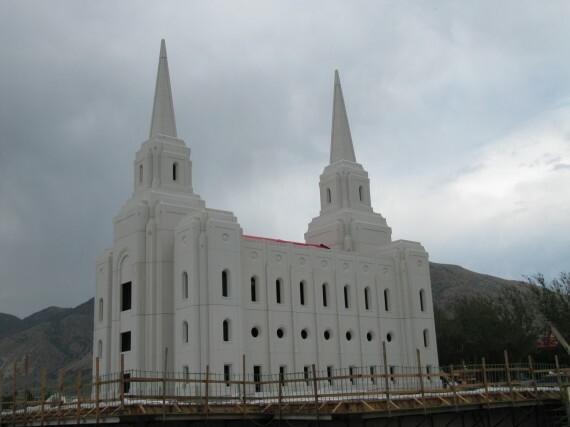 Jill tells me that yesterday they were not in place. I didn’t know that the walls were prefabricated offsite. 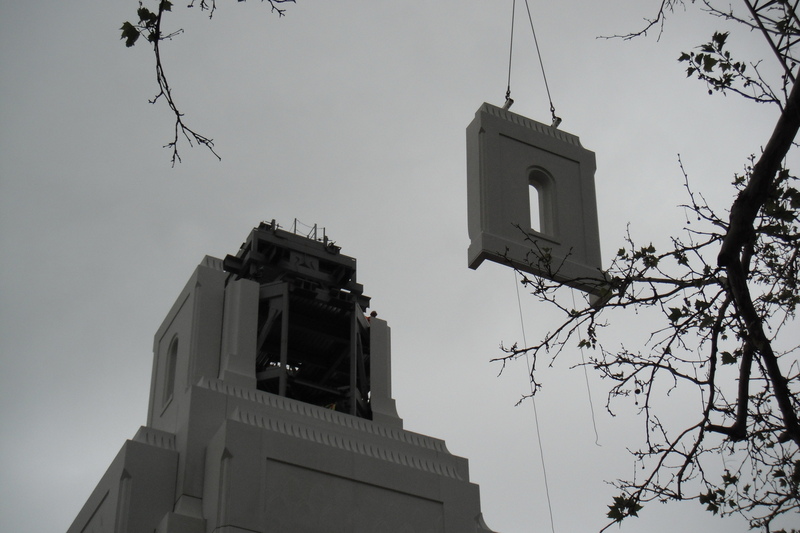 Anyway, enjoy the photographs. I expect that the next visit will show an even more startling transformation. 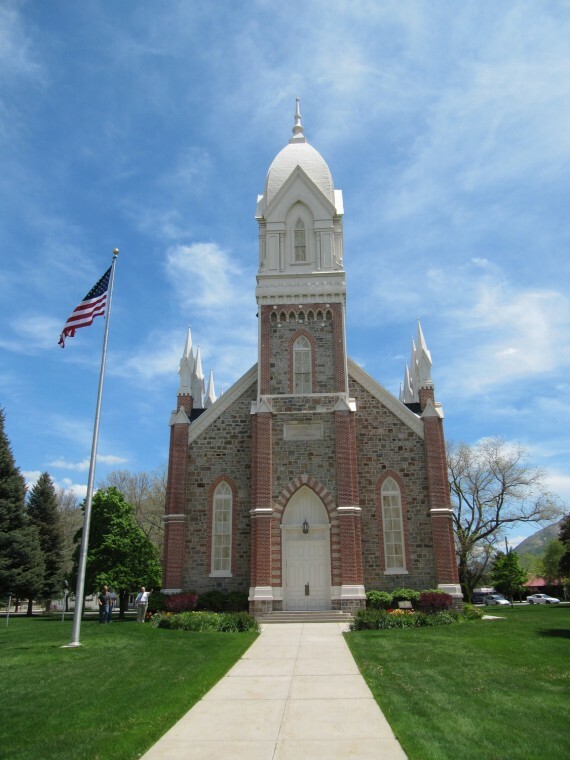 In 1865, Lorenzo Snow asked all the Brigham City merchants to unite their businesses for the common interest of the community. The purpose was to provide jobs for everyone and to make the people self-sustaining. 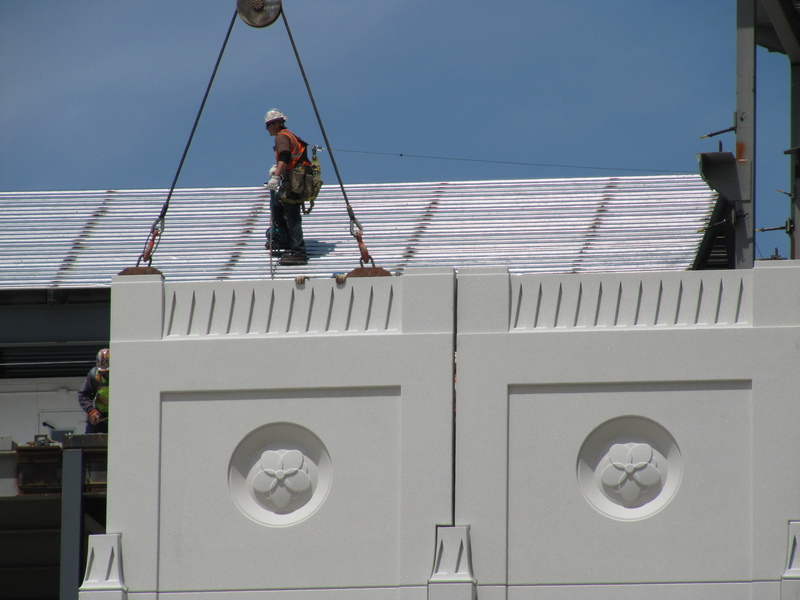 Most supported the request, and on December 7, 1865, the cooperative enterprise was formed. 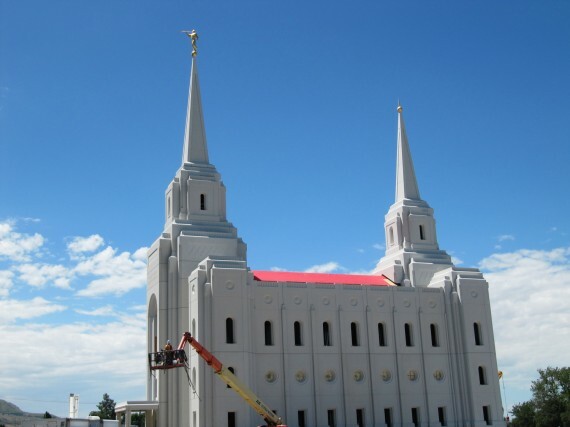 Lorenzo Snow, Samuel Smith, William Thomas and Alvin Nichols were the first stockholders. 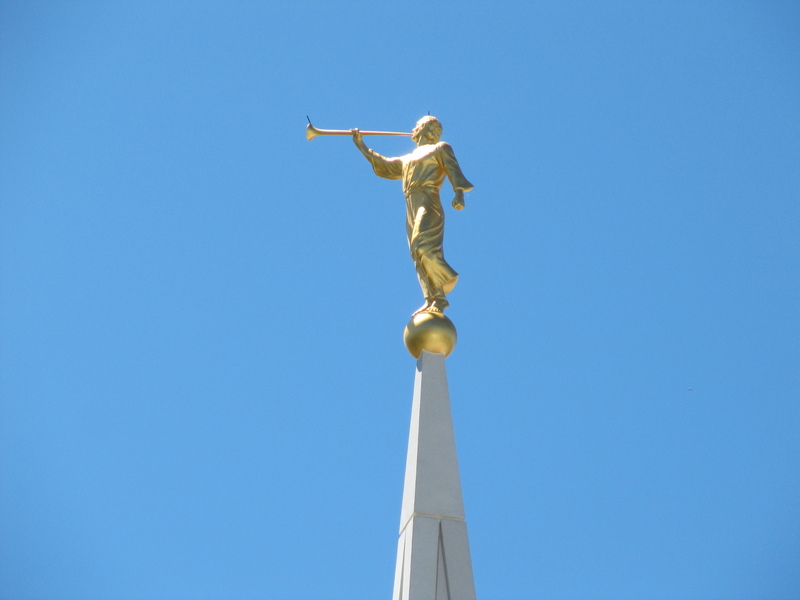 Stock was sold at $5 a share, and produce and labor as well as cash, were accepted. 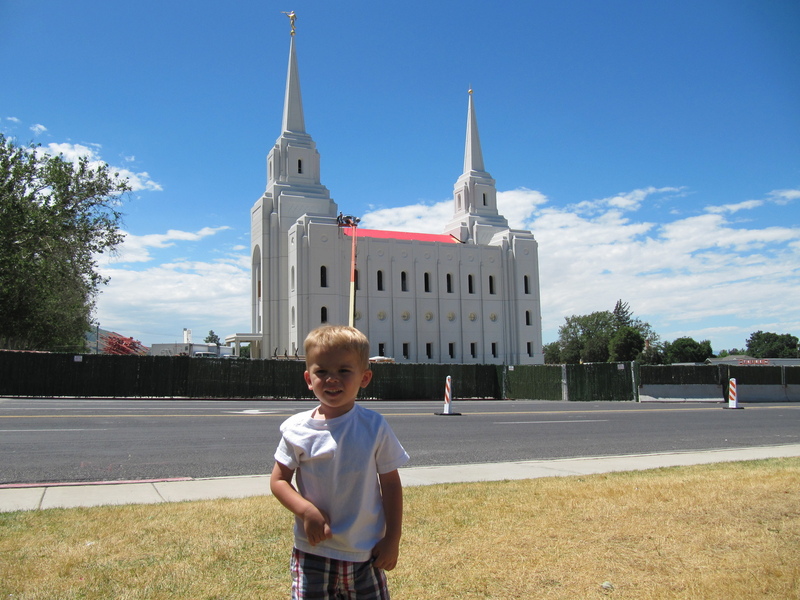 The first business was a mercantile store. When the store had made enough money, the association established its first industry, a tannery. 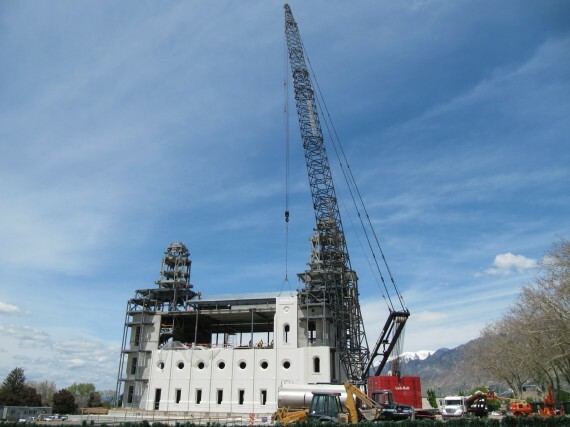 To comply with the Territorial Incorporation Act of 1870, the cooperative was incorporated December 15, 1870 and became the Brigham City Merchantile and Manufacturing Association, commonly known as the Brigham City Co-op. 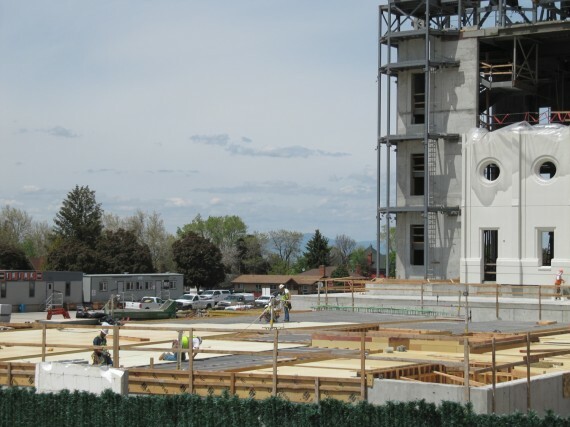 Almost every resident of the community was involved in some way. 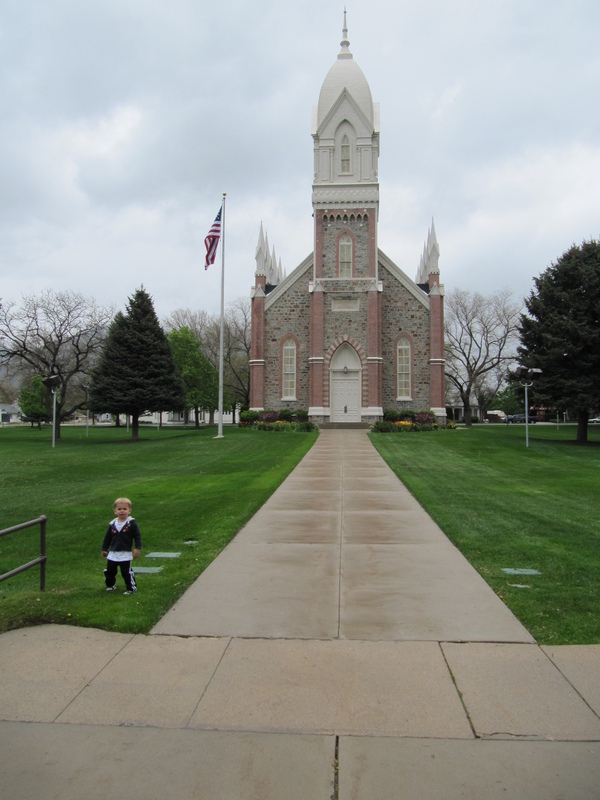 Thursday found me in Brigham City for the funeral of Kamdyn Ross Brown. 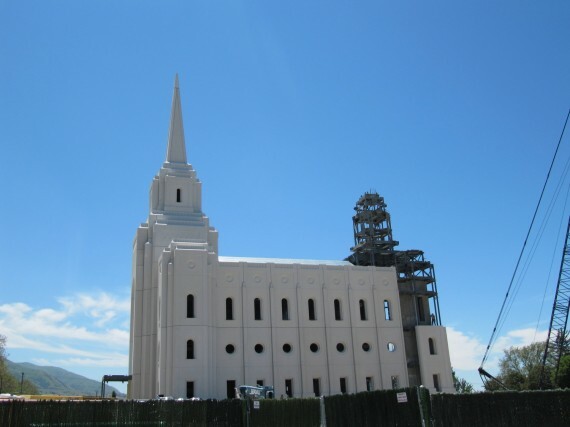 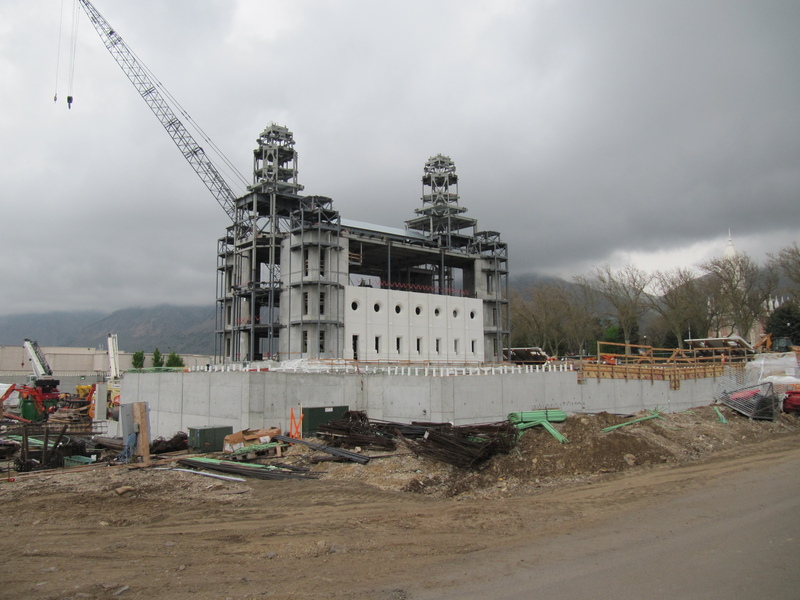 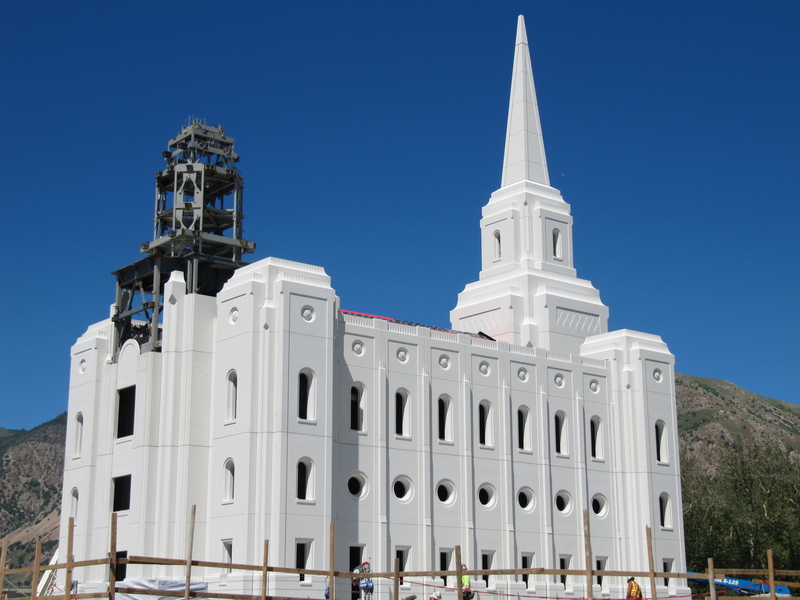 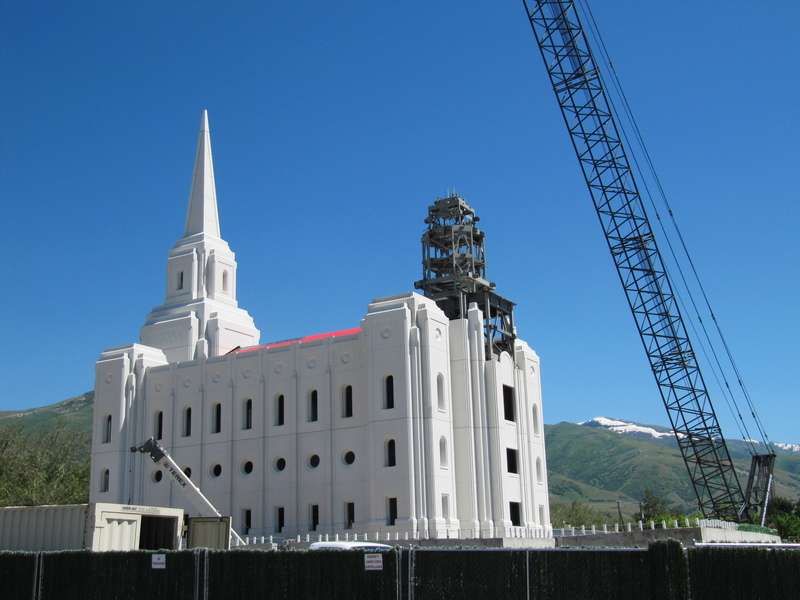 I was a little early so I stopped for a few minutes to take photographs of the construction of the Brigham City Temple. 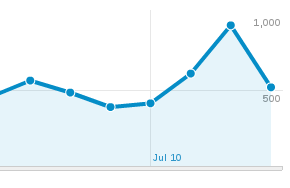 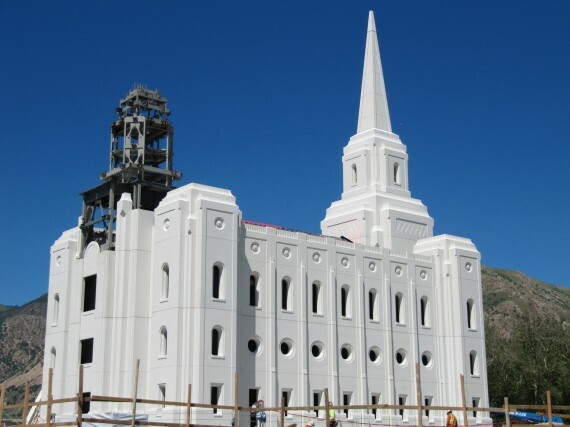 My last post about the Brigham City Temple construction was 15 days ago. 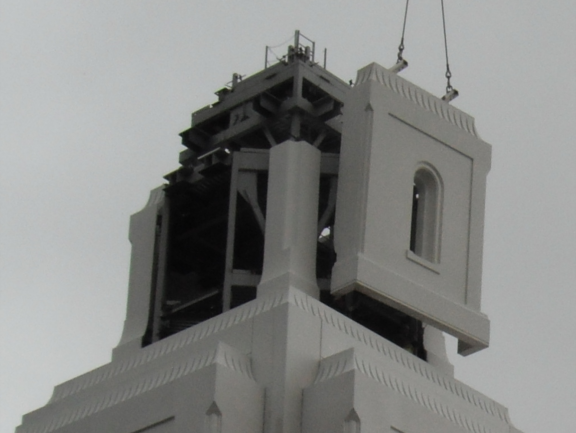 Then I focused on the east spire. 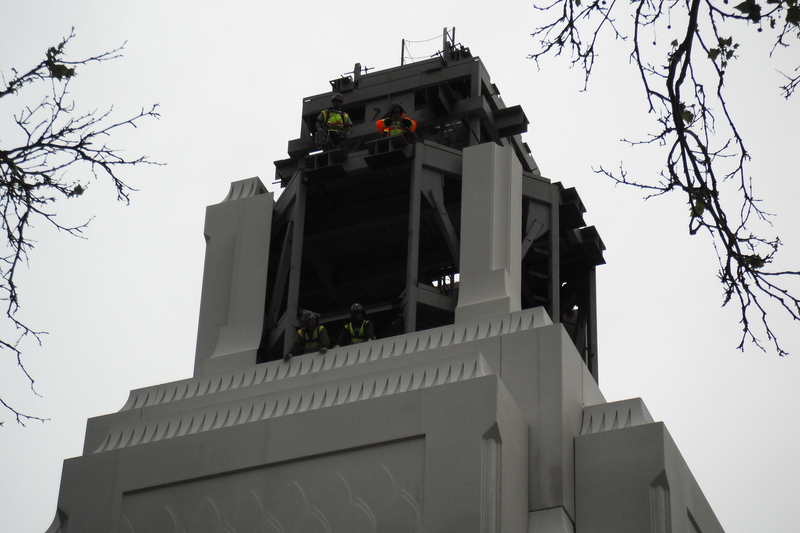 Today one can see the base of the west spire appearing and also part of the roof of the temple. 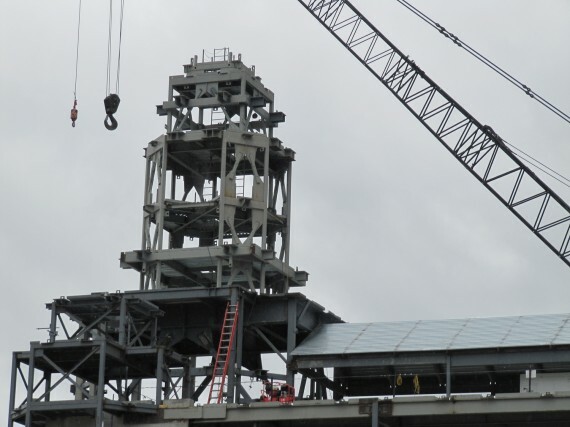 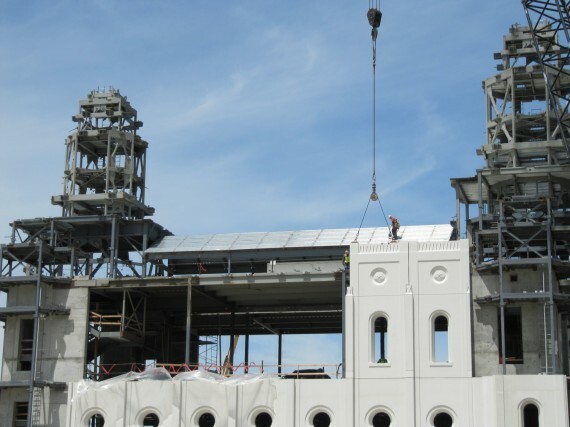 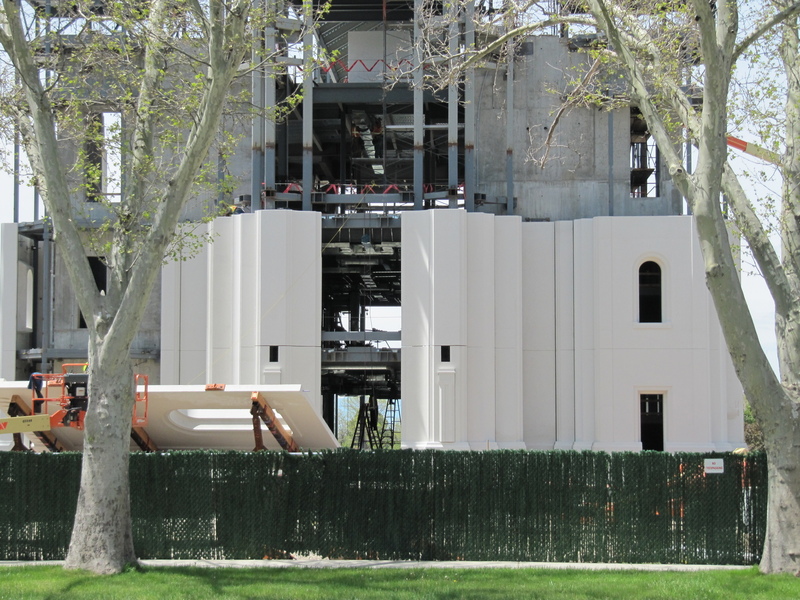 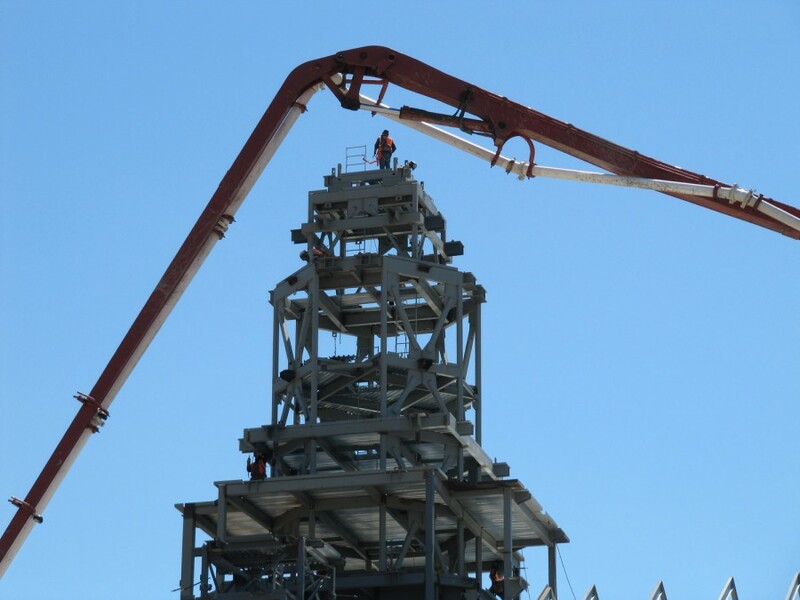 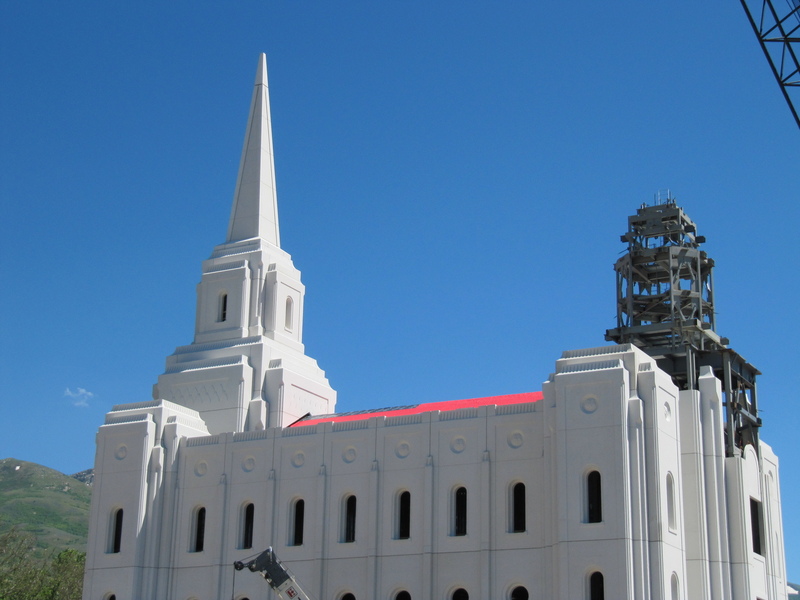 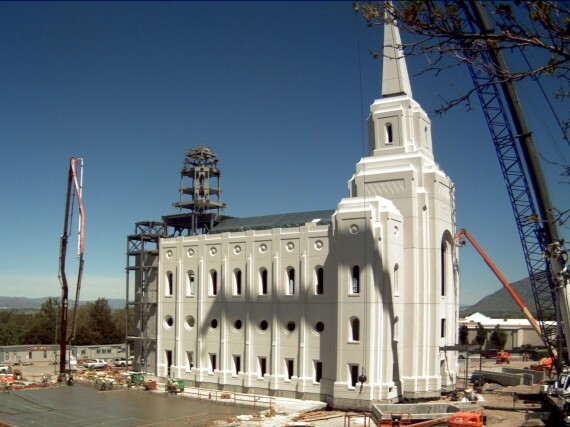 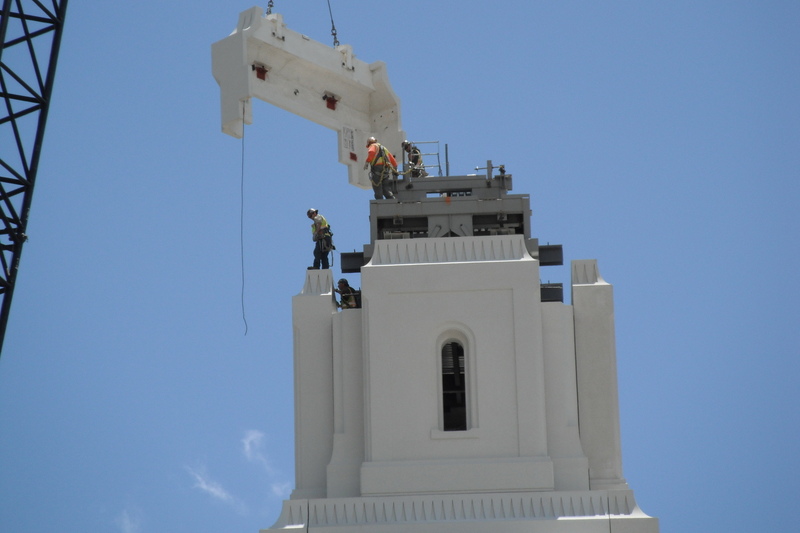 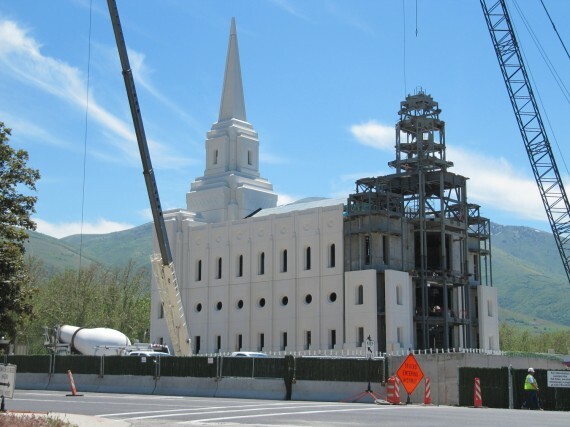 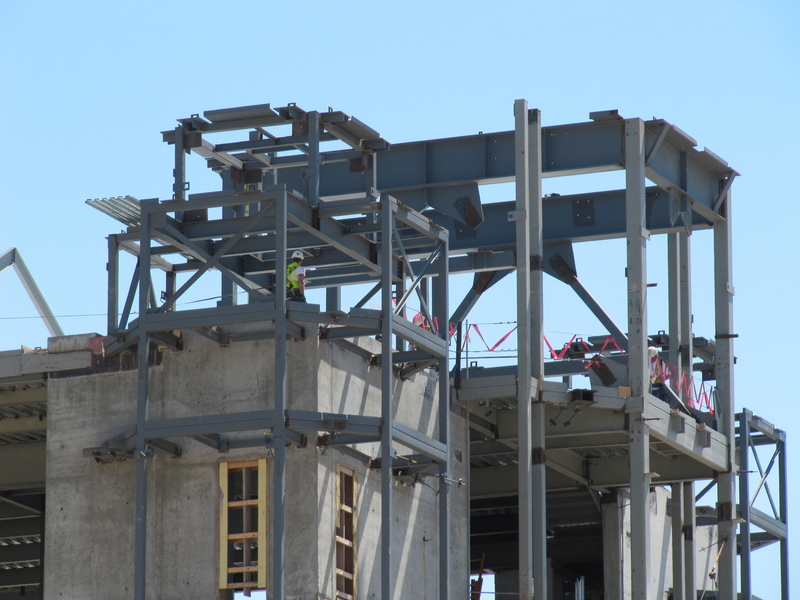 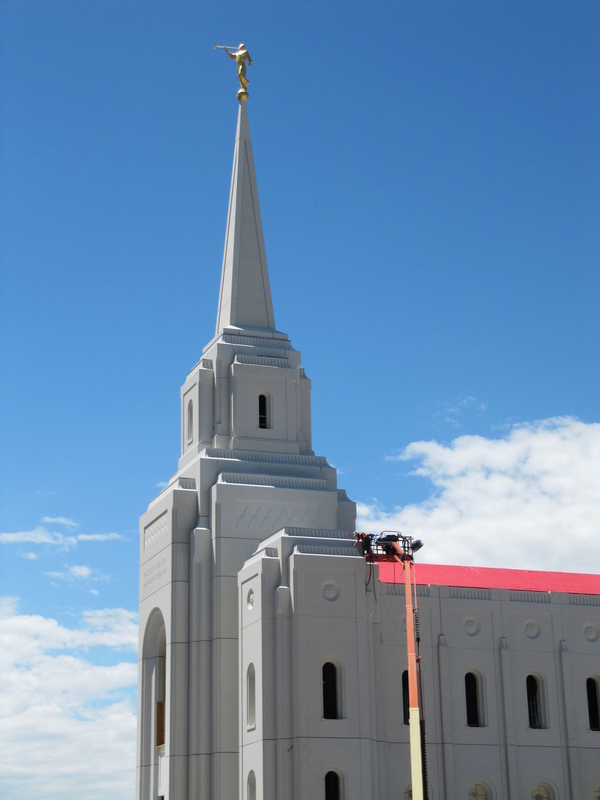 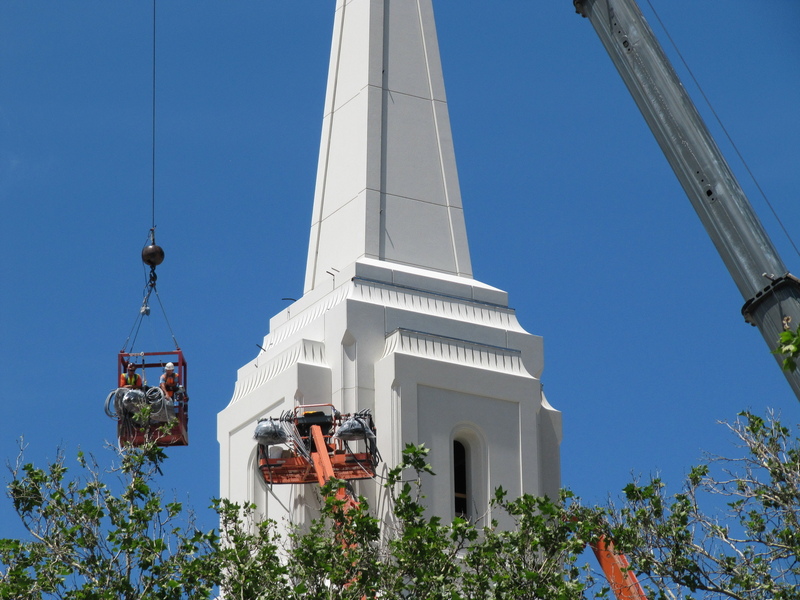 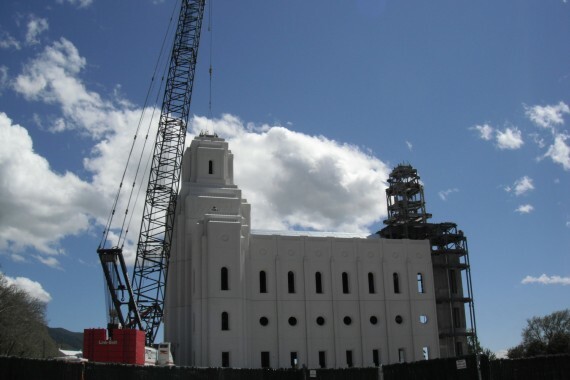 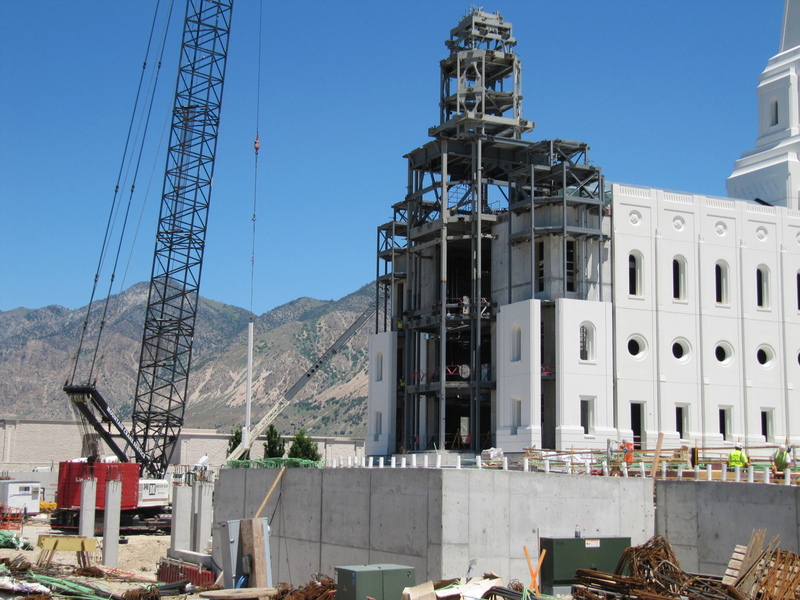 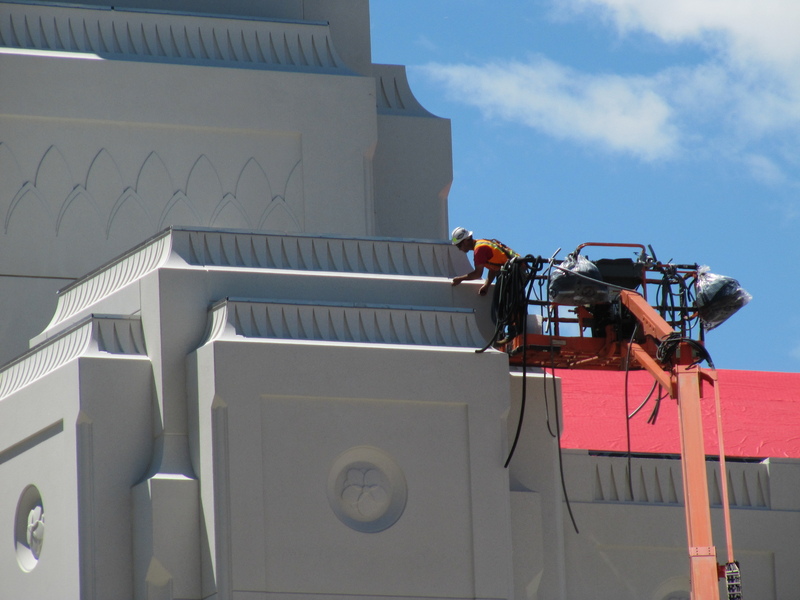 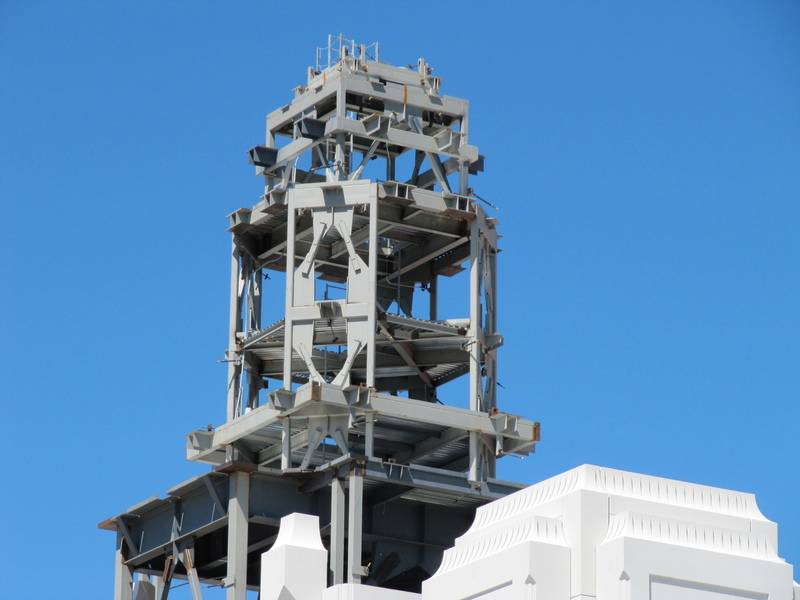 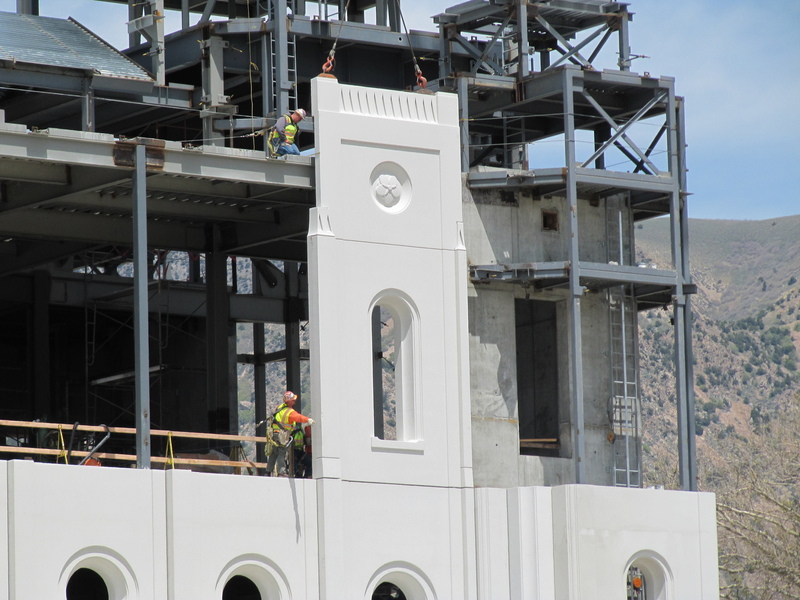 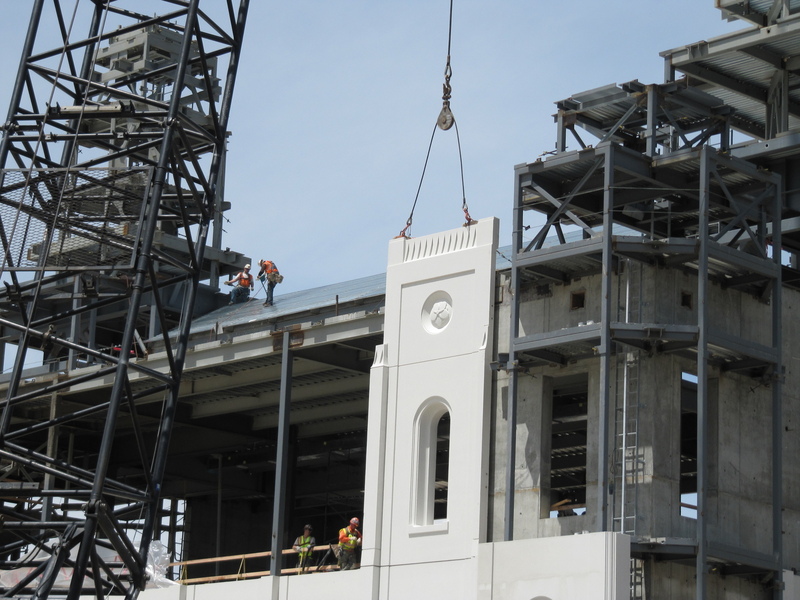 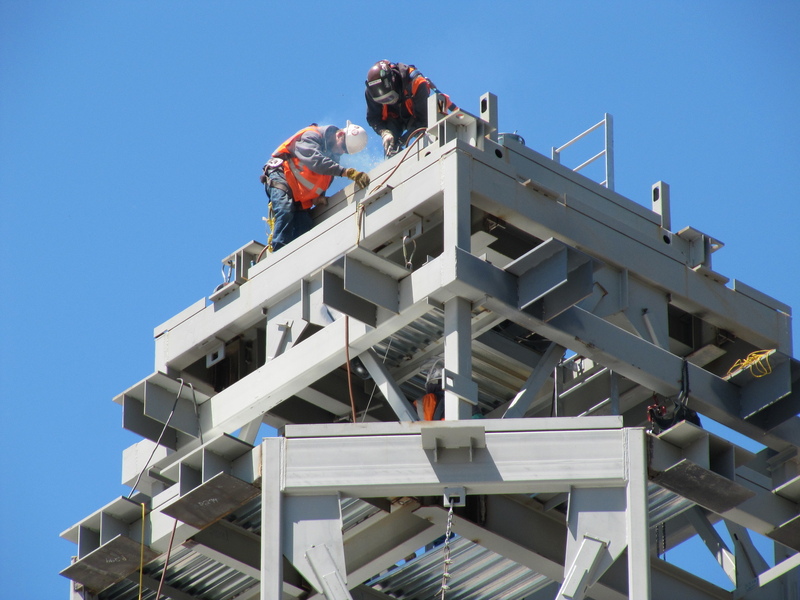 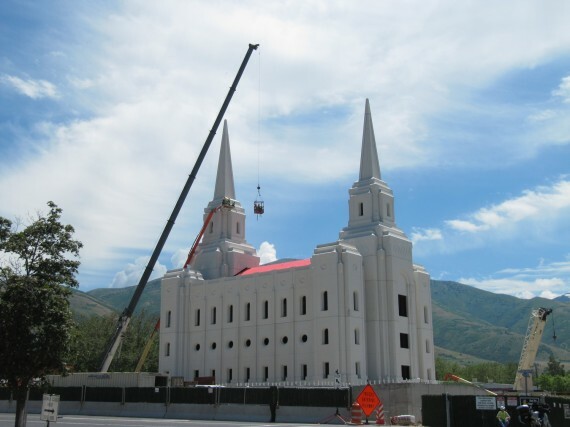 The temple’s angel Moroni will be placed on the east spire. Two of the photographs, when clicked, will show the same view, only much closer. 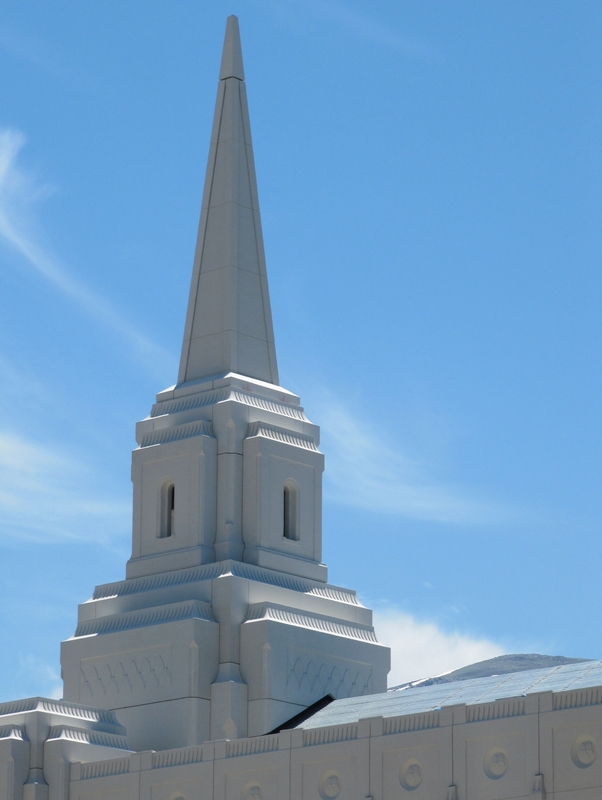 Let me know what you think of the larger format of this post over a regular post. 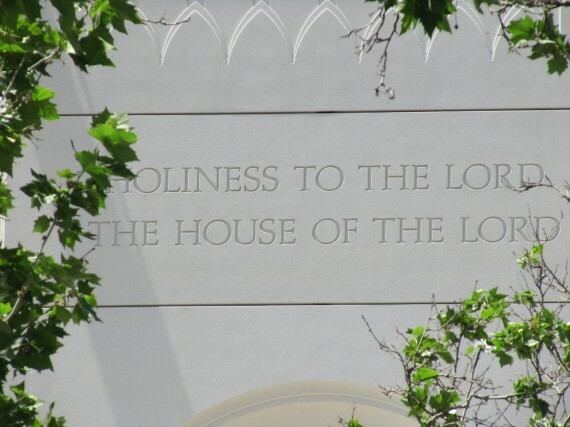 While the photographs are larger it can be annoying reading text that is spread so wide. 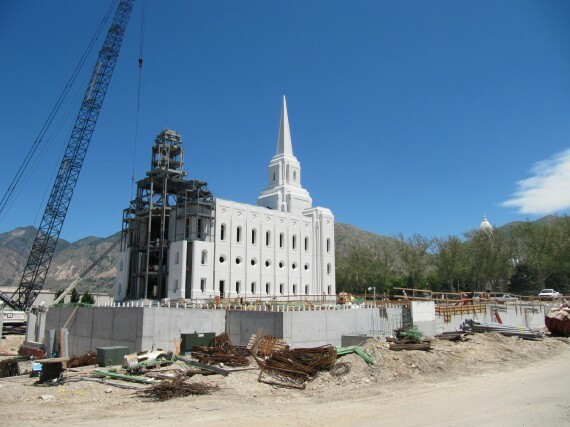 All the people were poor and worked hard, but they found time for rest and recreation. The young girls made games involving their work, such as competition between neighbors to see who could produce the whitest laundry. 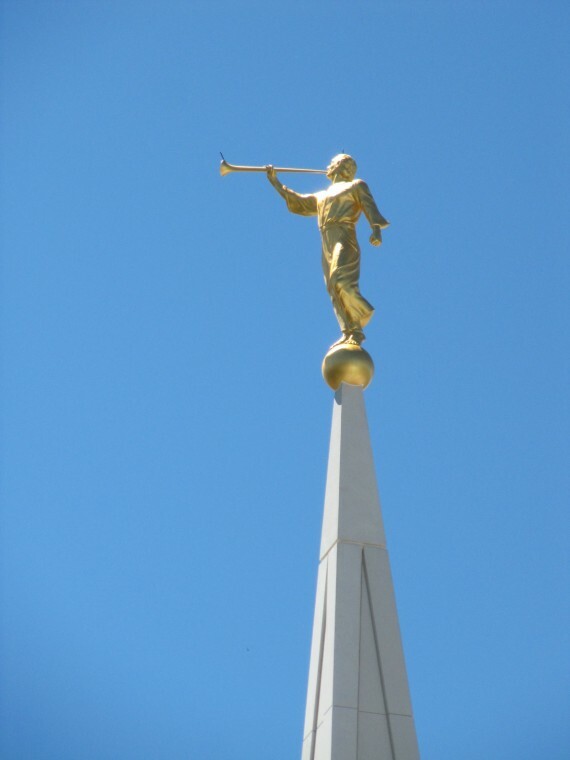 They organized spinning clubs where each girl would bring her wheel and yarn and visit while she worked. 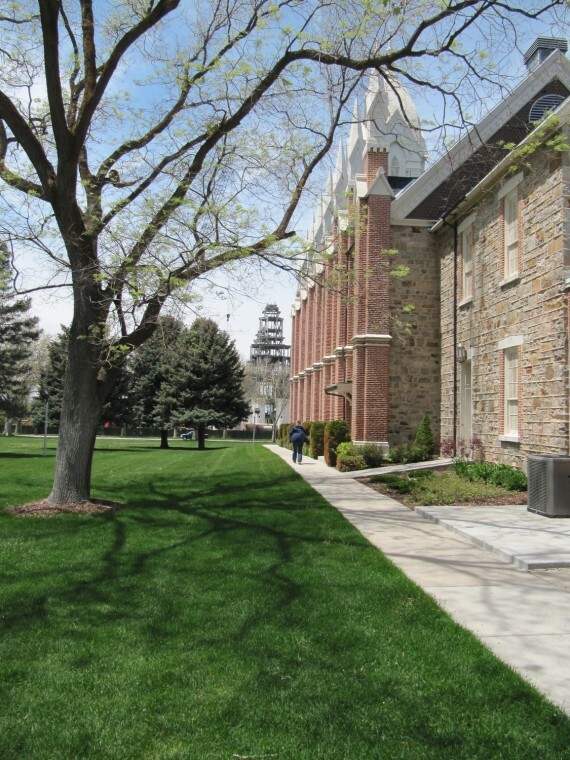 The women also mingled work with play as they gathered husks to fill mattresses and held quilting and rag bees where everyone quilted or sewed carpet rags for homemade carpets. 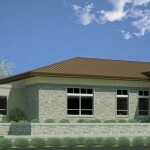 These work socials often ended with dancing and singing. Lars Mortensen frequently invited neighbors and friends to the two largest rooms in his home for dancing. Parents would bring their babies and tuck them away on top of clothes in closets while they danced. Lars Christensen played his fiddle, and refreshments were always home-made rootbeer and molasses cookies. 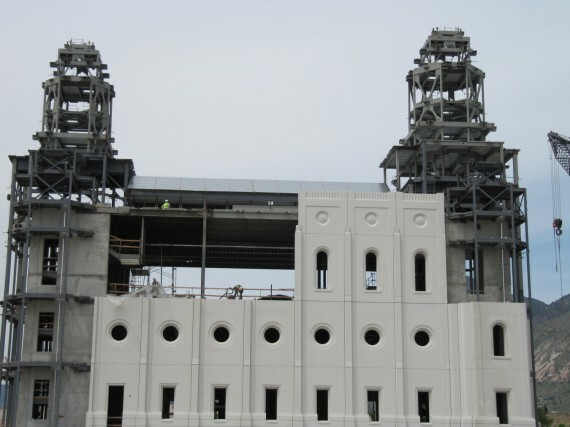 Tickets were bought with a few potatoes, corn or other produce.